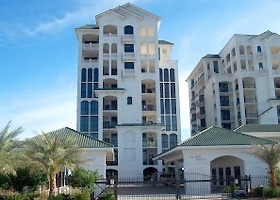 La Belle Maison condos are located in the beautiful community of Perdido Key, Florida. This stunning condominium development features only fourteen units with high-end finishes and superb amenities like indoor/outdoor swimming pools, hot tubs, a sauna, and access to private beaches. La Belle Maison owners and their guests can also enjoy a barbecue area, fitness room, and large sun deck. This low density complex is rent-restricted and exceedingly private, with each floor of the building containing only two units. This allows for the “corner unit” appeal in every residence. The top two floors are the penthouse levels with Gulf views that are impressive and sweeping. Security is not a concern at La Belle Maison because each residence has its own gate and elevator codes. To arrange a tour of La Belle Maison condos in Perdido Key, please contact us. Our Perdido Key REALTORS® will be happy to help! Sign up now for FREE for complete access to our Perdido Key condominium listings, including detailed property specs, area maps, photos and more! Registration also enables you to bookmark your favorite properties, share listings with friends & family, and save your preferred search parameters to save you time on your next visit. The floor plans featured at La Belle Maison are spacious four bedroom, four and a half bath, while the penthouses offer five bedrooms and five and a half baths. Floor to ceiling windows and doors immerse the living areas in natural light and airy views of the one hundred feet of private white sandy beach of La Belle Maison. Large private balconies and climate controlled storage are also available to owners of La Belle Maison. La Belle Maison real estate is near the Alabama-Florida state line and numerous options for entertainment and dining. Perdido Key is also known for its natural splendor and pristine beaches. La Belle Maison is ideal for a year-round residence or a second home. Contact us today to schedule a private tour of these unique luxury condominiums. For more information about buying or selling condominiums in Perdido Key, please call today!